“I should perhaps declare my interest. For I had a fairly minor part in Howard Brenton’s Reformation romcom about the ill-starred Anne. But rather than doing the sensible thing and thinking about my character, learning my lines, and working out how and where I should move and stand, I tormented the poor, put-upon director, by suggesting myriad ways in which we could turn a serious analysis of a transformational moment in our island history into the gaudiest of musicals, insisting, for example, that the show should end with a high kicking rendition of “I’m Henry the 8th, I am, I am”. I will not trouble the reader with any of my many other wholly sensible suggestions, nor the weary response of the Director. Not least because I had absolutely no idea what ingredients were needed to bake a great musical. After PTG’s Carousel I know exactly – for this was a magnificent confection – tasty, robust and vivacious. Nor was it in any way saccharine. I was struck that for all its good cheer, Rodger and Hammerstein reflected on some pretty tough themes: domestic violence, hubris, vanity, poverty, death, the consequences of bad choices – and even the price of redemption and peace. But this is not to say this was not an evening full of joy, for it certainly was. 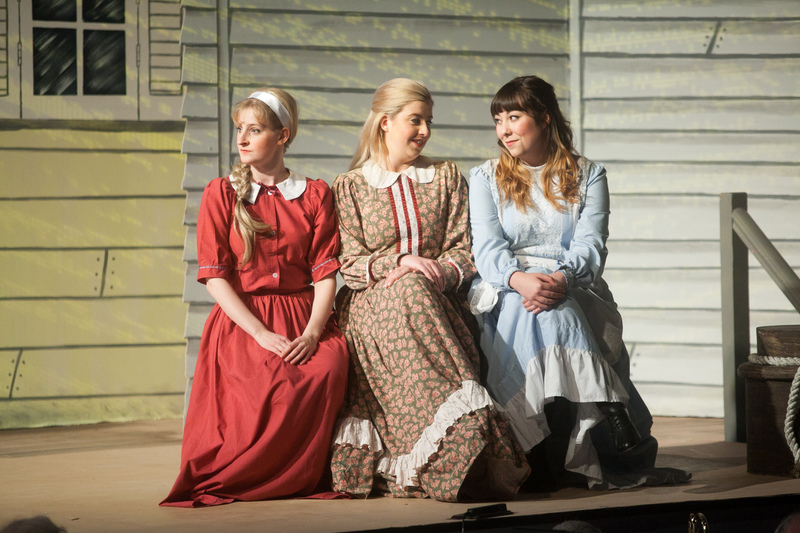 Alice Manville and Emma Lumb, as Julie and Carrie, excelled, their voices as clear as bells, conveying the full gamut of emotions their less than satisfactory male partners put them through: pathos, happiness and despair. Mark Davies, as Enoch, showed off his lovely tenor voice to good effect, while Elliott Port, as Billy Bigelow, really caught the tensions in the character, torn asunder by his anger and fecklessness as they warred with his innocence, innate goodness and inarticulate love for Julie. They were joined by perhaps my favourite – Simon Crates, who conveyed some real menace as bad boy Jigger. Perhaps my greatest pleasure was in the big full-cast show stopping numbers, especially a cracking “June is bustin’ out all over the place” at the end of the first half. But perhaps even more than the music, I wondered at the energy, enthusiasm and sheer elan of the cast, from the fabulous athleticism of the men’s nautical dance mash up to the women’s enthusiasm for the joys of the clambake and treasure hunt, all supported by a cracking band. Everyone worked hard for every single moment they were on the stage, even if the action was elsewhere – giving an added zing and bounce to music it was hard to imagine could be any more zingier and bouncier. All in all, it was an inspiring spectacle. And I found myself reminded of something I have been reading recently; a work of religious reflection, which concludes that value, indeed glory, can never be found in seeking some unattainable perfection, but in the joy and intensity we put into our labours, the alacrity with which we use our gifts and our reciprocity and generosity in sharing and growing as a community. And that is precisely what I saw on stage. In Noel Coward’s Private Lives, one of his cynical, dessicated, joyless snobs, comments that it is “extraordinary how potent cheap music is”. That is a judgement on them, not the music. Because “cheap” – for which read popular – music is potent when it speaks to ordinary people’s deepest feelings and fears. And that music is given further depth and life by the joy and intensity, alacrity and generosity with which wonderful enthusiasts like the PTG invest it.